Cracks: Cracks in a vinyl soffit are caused by very low temperatures or impact. Cracks in wood can be caused by improperly seasoned wood or by extreme climates. In either case, the affected soffit can be replaced without additional action. Small Animals: Small holes or cracks within a soffit are often widened by animals such as birds, mice, and squirrels. They nest within the rafters and can damage structural members. Removing any nesting materials and repairing soffits quickly will prevent significant damage. Repairing a vinyl siding soffit is a simple repair to make, especially if you already know how to install vinyl siding. To replace vinyl siding, a specialized piece of equipment, called a zip tool, will be required to separate the vinyl siding panels. It is often easiest to remove an entire panel rather than cut out the damaged area. To complete this task, the soffit must be removed from the J channels that hold it into place. A zip tool should be used to detach it from the surrounding soffit panels. Be sure that the replacement soffit panel matches the panel that was removed. Then place the new panel into the J channels on the exterior of the home and near the fascia. Use the zip tool to lock panel edges into place with the surrounding panels. Although wood soffit repair is slightly more difficult than replacing a vinyl soffit, it is still a reasonable job for a homeowner to undertake without professional assistance. Begin by removing any molding on the fascia or exterior wall of the home that is adjacent to the soffit. Using a jigsaw, cut out the damaged soffit section, creating a rectangular hole to patch. Be sure to to cut as close as possible to the rafter edges and rafter lookout. If the soffit is made from tongue and groove wood, it is important to cut a hole that follows the grooves in the wood. Add nailing strips at the edges of the hole in the soffit, fastening to the rafters or rafter lookouts. Measure the hole carefully, and cut a patch to fit. The patch should be slightly smaller than the hole, to allow for expansion. Care should be taken to match a tongue and groove patch to the existing soffit. Nail or screw the patch into place. Fill in gaps between the patch and surrounding soffit with acrylic caulk. Smooth the caulk lines before the caulk sets. Allow the caulk to dry, then prime and paint the patch to match the soffit. Before patching the soffits, take a look at the exterior of the house. If the exterior of the house is generally in poor condition, consider contacting a professional to replace the entire soffit and exterior. 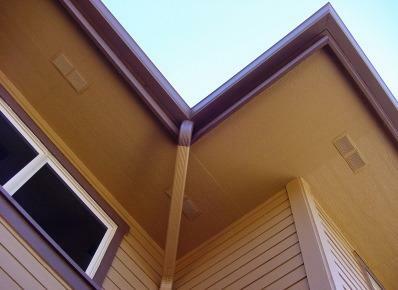 A soffit is often replaced when a home is sided or when other exterior home renovations occur. Homeowners who are uncomfortable working on a ladder should also strongly consider the help of a professional.